B2B content marketing, when done properly, is useful in driving traffic to a site. This strategy can establish the expertise of a person or a company through the knowledge it offers. It helps publishers build trust with the clientele by giving them relevant information for free. It activates the buyer’s journey down the sales funnel and consequently triggers a purchase. B2B content marketing strategies are showing results because, in the present era, millennials hate ads. They are more affected by content marketing that is genuine, relevant, and engaging. Now that you are considering getting into content marketing, let us start by highlighting key points that we are going to learn here. 1. What is B2B content marketing? Content marketing is the process that involves the creation of content that is informative, entertaining, compelling, and highly valuable. With content marketing, consistent publishing is a must because it has high potentials to change a customer’s behavior. While it may not necessarily involve direct selling, it is crucial for customer acquisition and retention. To improve its chances of impacting the reader, create engaging and inspiring content. If not, it will have no value in marketing your product or service. In the past, one could measure the effectiveness of content marketing by looking at the traffic that came to the website. However, it was not an efficient way to measure performance. When you measure the engagement with the content and the conversion rate, you will get more insight. 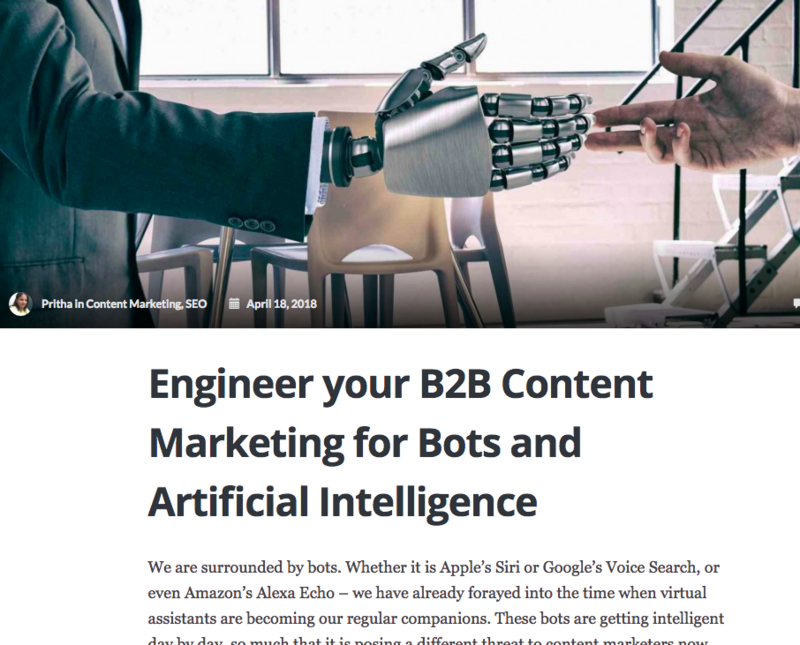 A good example is this article on Aritic PinPoint blog- Engineer your B2B Content Marketing for Bots and Artificial Intelligence. Although this blog does not directly relate to any product features within Aritic PinPoint, it was written for marketers who use marketing automation tools. A marketing automation strategy cannot survive without good content; and to produce good content, it is important to stay updated with the new trends and changes. This blog was designed to attract new customers indirectly. Ofcourse, who’d complain about search engine traffics after all?! Content marketing dates back to the 1700’s during the time of Benjamin Franklin. Benjamin Franklin, during his days, was an owner of a publishing business. 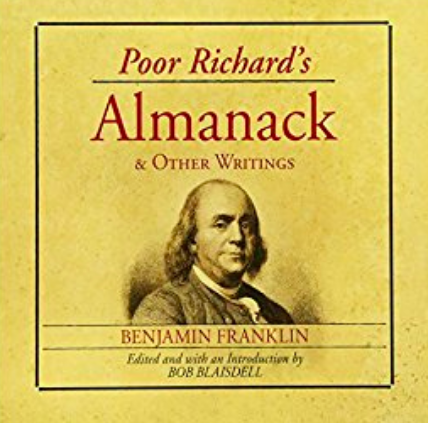 Benjamin Franklin used to publish ‘Poor Richard’s Almanack’annually to promote the business. 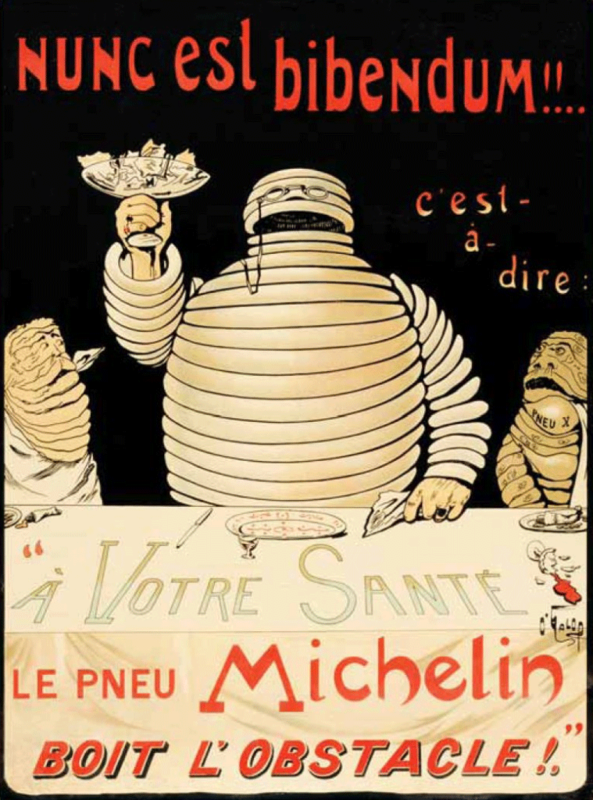 In the 1900s, content marketing saw a new trend with Michelin brothers using the Michelin Guide. It did not quite make sense at that time for a tire company to make guides to restaurants. However, the Michelin brothers continued to use this method to urge people to go on road trips by car, and to buy Michelin tires for their cars. An 1898 poster for the Michelin Man in his original form as an upper-class man. His champagne flute is made of broken glasses to show how Michelin’s air-filled tires can literally ‘drink up all obstacles’. Image Source: TM: The Untold Story Behind 29 Classic Logos. 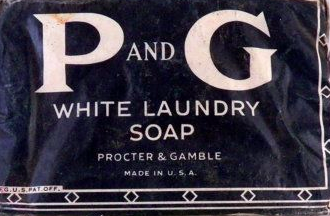 Moving on to 1930s, P&G came into the limelight with ‘soap operas‘ in form of radio dramas. These dramas would feature soap products like Duz. There were many evolutions and new trends, one after the other, that made content marketing what it is today. It is a long story that Content Marketing Institute has very nicely put together in this infographic below. You may be wondering why you need to give their time to content marketing in B2B marketing. For all the successful companies we have online, there is a smart content marketing plan at work. Their rate of success compels anyone to put their house in order and have content marketing. 91% of marketers are using content marketing although around 63% do not have a documented strategy. Leaders with content marketing experience 7.8times more traffic to their sites than non-leaders. 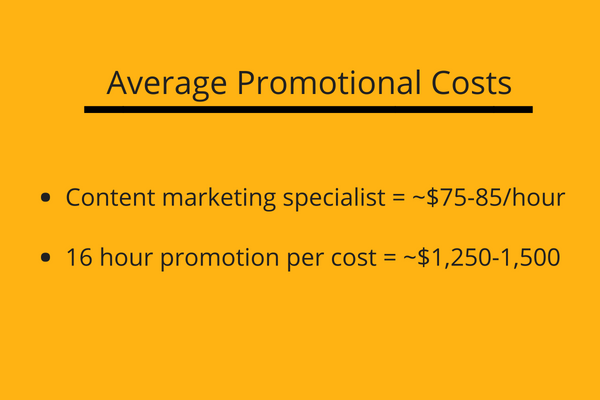 Outbound marketing costs 62% more in comparison to content marketing. Content marketing earns one more three times as many leads. Small businesses that have blogs experience 126% more growth in leads in contrast to those without. 81% of online consumers will trust information from blogs. Content marketing leads to around 6 times more conversion rate for marketers that adopt the practice. Companies that commit to publishing content will have 434% more indexed pages than those that do not. For instance, Buffer grew their traffic to 1.5 million only through blogging. Buffer revealed its case study in 2017 where it showed the growth using data from 2011-2017. Like all organizations, Buffer got to this point through trial and error. They discovered the kind of content their audience likes and focused more on replicating them for success. And whoa! it worked. Content marketing will enhance your SEO strategy because it earns you more inbound links. Your domain authority will increase. Content marketing also helps when you need to repurpose articles you need for social media campaigns and email marketing. Cross-promotion with content marketing opens you up to more prominent opportunities through other brands. Content marketing helps in urging people for email signups. Offering exclusive content like reports, white papers, and so on will massively boost the chances. Using content marketing, you can also drive in an extra source of revenue in B2B marketing. You can create eBooks which offer more insight and sell them to customers. There are 51% of B2B marketers who indicate that their content marketing expenditure will increase in the next 12 months. On average, we have 28% of marketing’s budget spent on content marketing. Even so, other more effective marketers will put 42% of the budget for this while the best marketers use 46% of the budget. First, you need to figure out whether or not you need that budget for content marketing. Your budget must align with your goals. Check if you stand to benefit from it. Note that there are some businesses whose ROI from content marketing is not as significant as from other marketing strategies. Therefore, you have to understand what you will gain from content marketing. This will show you whether or not it is worth the effort. If you are wondering how you can establish the ROI of your current B2B content marketing strategies, here is a tip. Use Google Analytics but have your goals in place first. Click the “conversions” ‘button.’ Then click goals, then overview. Check the source/medium and check out the “Google/organic” to see the current ranking. From there, you can make a sober judgment. When dealing with promotion, many people know that organic traffic in B2B marketing is ‘free,’ but for content creation is very different. Some costs come with content marketing . Here are some of these costs that you ought to prepare and budget for B2B content marketing tactics. Since the design of your site gives the viewers a viewing medium of the content, it is crucial. There is nothing wrong with having the best content in the whole world. But if your readers are struggling to view it because of aesthetic and usability issues, then content marketing efforts will be useless. The technical structure of your website will affect the SEO. In turn, this will affect the content marketing campaign’s performance. Ross Hudgens, the founder of Siege Media stated something very striking. He said that we could expect to pay at least $6,000 for a quality website. The price can go as high as $20,000. The cheaper way out will be to customize a theme instead of going for a custom design. But remember, more reasonable can be costly regarding quality. Other than poor quality, you may also have technical issues. Content marketing and blog posts are inseparable. They are the primary drivers of traffic. They hugely impact SEO, and it is an influence on the audience. It makes your brand out to be an industry thought leader. Working with a person who is writing in a first language that is not their own, grammar and spelling issues will be the price to pay. Also, do not expect too much when it comes to SEO knowledge if the writer is cheap. Always remember that for every content you want to publish, Google will run a readability score analysis. This determines the content’s relevance to the target readers. For an average blog post, the price is never static. 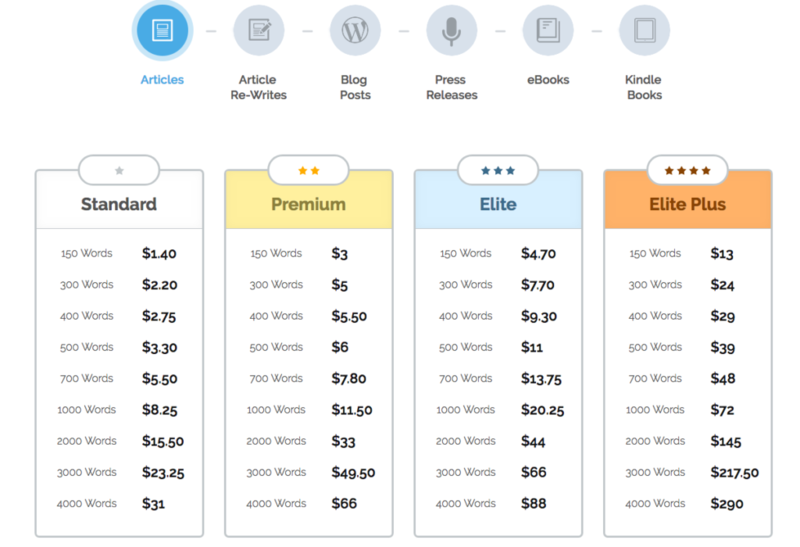 A blog post of 500 words can cost you between $150 and $350. For those best writers write, it can cost you $2,000 or more. The beauty of working with pros is that they will carry out thorough research. They will also write the content excellently, will require minimum edits, and they will think it through thoroughly. You may think that 500-word content will always suffice. It will not be enough at all times. More extended content will give you better SEO returns and better success rates. If you are trying to squeeze your budget for content, then content marketing may be a terrible fail. To get high-quality content, you can try these two sites. Infographic is a big part of content marketing. When the infographic has a perfect design, you will have outstanding results. Infographics costs between $2,000 and $3,000. If it is animated, it can cost you up to $6,000. Here, you can spend between $3,000 and $20,000 in a month or more. This cost sometimes is minus the value or ads. This can bring you to a price range of $10 and $100 for a single post. This process can go higher for higher-level ads such as Facebook, LinkedIn, Pinterest, and so on. Ensure that your social media marketing service provider is accountable by requiring analytics reports. This is for the engagement and sentiment. 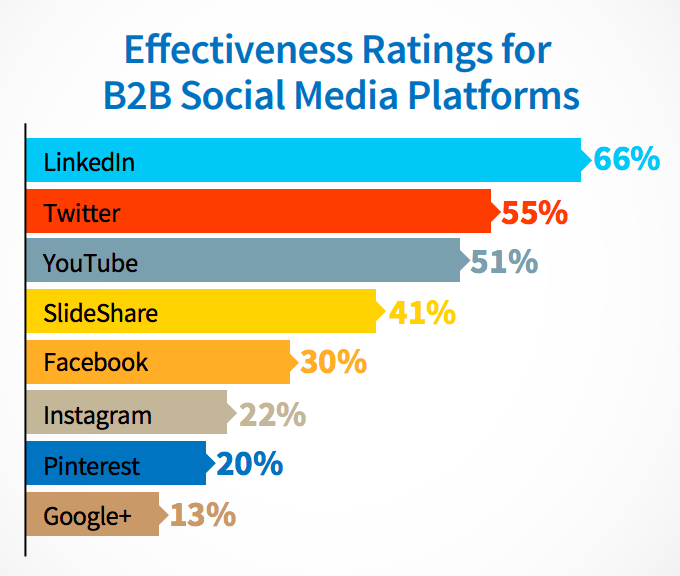 According to Content Marketing Institute, Linkedin (66%) is the most effective B2B social media platform, followed by Twitter (55%). It is important to understand which platform will work for your brand before you decide how much to spend in implementing B2B marketing ideas. If you opt for videos that are incredibly high quality, you stand to spend at least $3,000 for a video of one minute. This is the upper end. For businesses that wish to implement videos, they can now do so with great ease. You do not need production equipment that is expensive or an editing software. Individual marketing reports can cost up to $1208. In the real sense, they can cost almost half this price to produce them ($631). Siege Media recommends at least 16 hours in a month to be used for content promotion. It also suggests that you should spend between $75 and $85 per hour on a specialist. This means that in a month you can spend between $1250 and $1500. This cost is apart from the writing cost. This will ensure that all your audiences get the content that has taken your time to create. Some hidden charges accompany content marketing. These charges include competitor research, content auditing, and project design, and management. The figures we give you are a guide to what you may spend on content marketing. They are not standard figures in the market. Different businesses will incur different costs. A small business will not spend as much as a Fortune 500 business will spend. Here is something that will excite you. You do not need new or fresh content for you to achieve your business objectives. There is a general rule that says content is 65% created. It can be by the internal staff or from outside sources and freelancers. 25% of the content is curated, and the 10% is content that is syndicated. More than 80% of marketers say that they curate most of their content. The practice helps in increasing the visibility of the brand, thought leadership, enhance the SEO, and increase traffic. Five primary departments participate in content creation. Many marketers outsource 18% of their content while the best marketers increase this percentage by 6%. Outsourcing helps the supply their readers demand on time. The rest of the content is done in-house, or are curated, or syndicated. Current content marketing team lacks five vital skills. They are content creation, content leadership. Content promotion, management of the performance, and subject matter expertise. Writing and design make up the two top-most activities that companies outsource. Are you wondering about the most effective measure for a blog post? Here is your answer. Studies show that 2,000 words of blog posts rank better than others. Those with higher wordings rank better. However, you need not force your blog post to be 2,000 words. The number of bloggers who write posts of 500 words is less by 12% than in 2015. 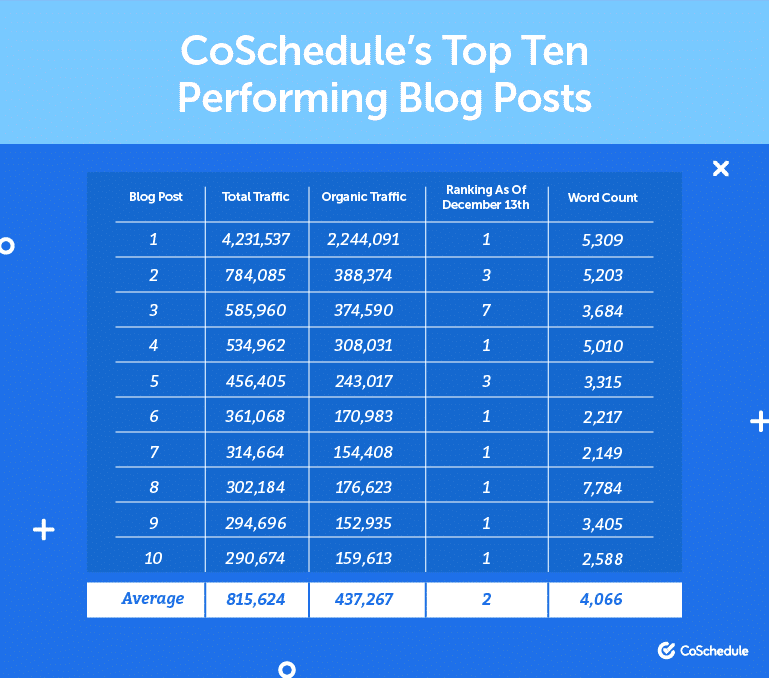 Here is an example from CoShedule’s results for their top performing content as well as the word count. This shows us that to determine a sufficient length, the goal of the content is vital. Here is a breakdown. As you post content, keep testing it to see what your target audience prefers. Those businesses that publish more than 16 posts in a month saw their traffic increase four times. This is in comparison to those that issue at least four posts. In case you think this is impossible, remember, some marketers outsource a more significant percentage of their content. Content marketing is here to stay with us; it only evolves. There are different forms of content. It is not only text. We have some popular content forms. They are case studies, press releases, white papers, videos, webinars, eBooks, social content, infographics, blogs, and e-newsletters. The choice of format to use depends on the purpose. If marketers get a chance to choose, they will select videos and not blogs. The percentage effectiveness of visuals is 41% with a rating of 37%. Visuals are doing better in comparison to blogs. 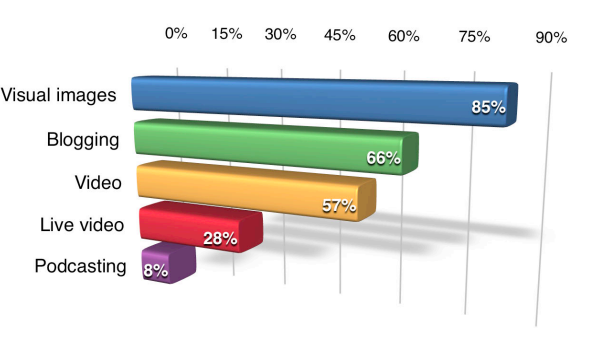 Typically, buyers will freely share their contact information for webinars (79%), white papers (76%), and ebooks (63%). For video and podcasts (19% each), they are very hesitant. 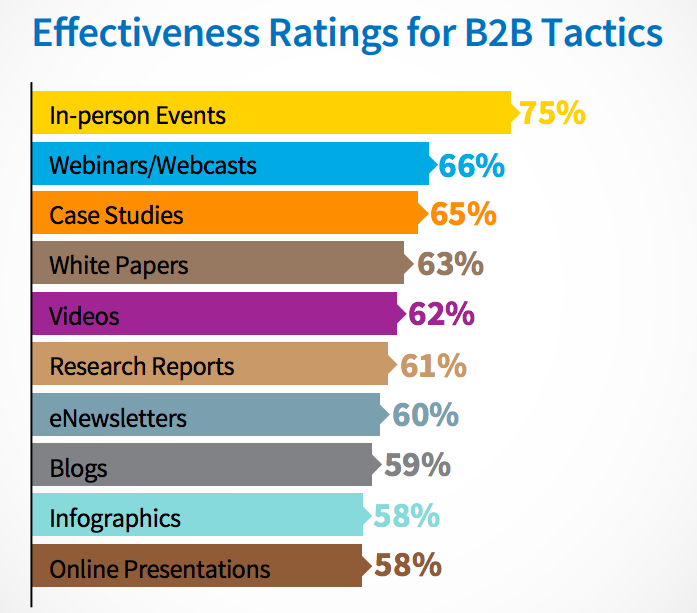 Also, B2B marketers use blogging a lot (75%) while B2C marketers are less likely to use it (61%). For live videos, B2C marketers are more likely to use them (30%) when we compare them to B2B marketers (24%). The conventional channels for distribution are websites, blogs, and social media sites. Social media sites include Facebook, LinkedIn, and Twitter. When using video, content marketers are choosing Facebook, Instagram, YouTube, and Vimeo as their preferred medium choices. LinkedIn is best for business content, but email is the best for all kinds of content. The top five favorite platforms for delivering content and engaging the audience are LinkedIn, Twitter, YouTube, Facebook, and SlideShare. 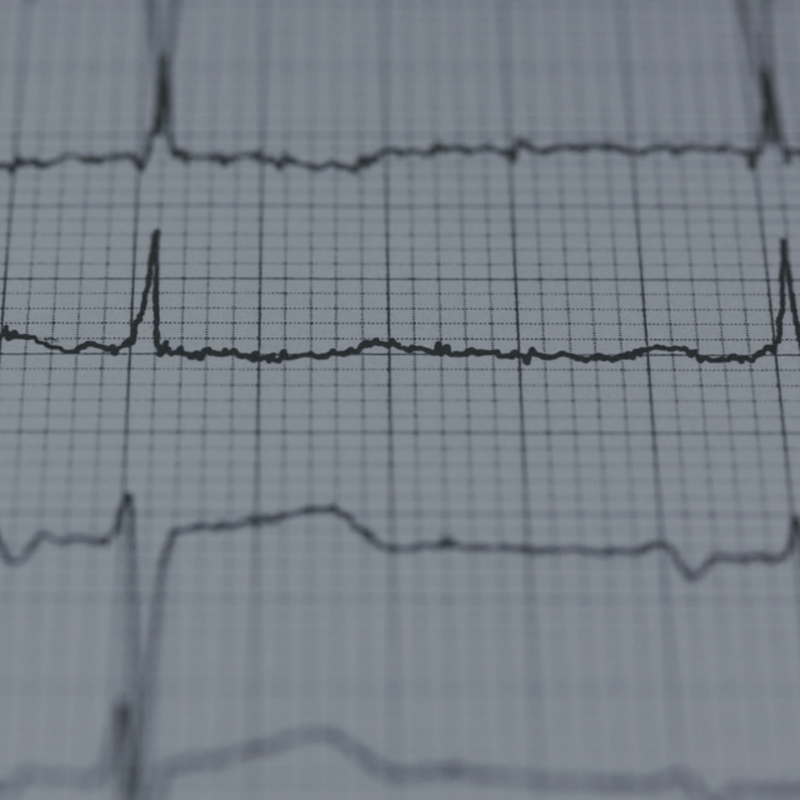 There are three primary distribution channels many B2B marketers love. They are Search Engine Marketing, Print and Offline promotions, and Online banner ads. There are social media marketing strategies that one pays for. They include advertisements for Facebook, Google, LinkedIn, Twitter, YouTube, and blog posts that are promoted. Around 23% of companies put between 6 and 10 hours in a week y. Content promotion on social media. 20% of the companies will use 21 hours. Over 90% of marketers state that investing six hours in a week for content promotion on social media resulted in tremendous exposure. Over 80% say that their traffic increased tremendously. Even so, only 30% of the content marketers believe they can measure the content marketing’s impact accurately. 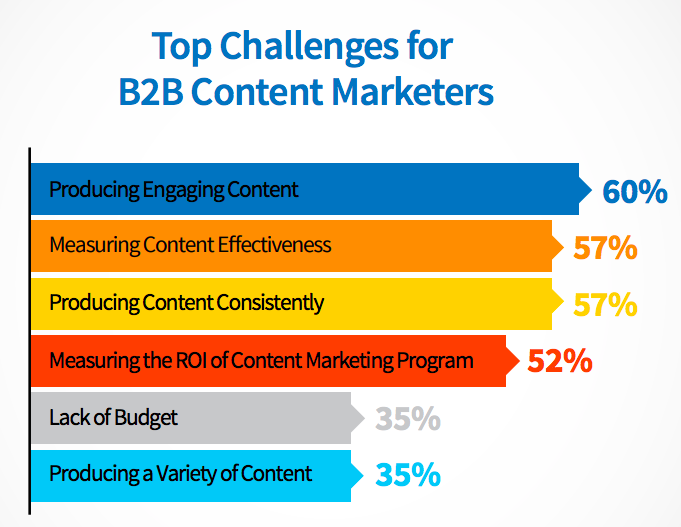 There are few top challenges that B2B business faces. These challenges are as follows. Some ways can lead your content marketing efforts down the drain. Below are some of the common content marketing mistakes that people make. It is a common saying that if you fail to plan, you are planning to fail. This phrase is correct with content marketing. Without a plan, you will be working with the mindset of ‘come what may.’ This mindset will sink your content marketing efforts. Up until now, businesses do not seem to understand this. 44% of marketers claim that they lack proper documentation of their content marketing strategy. Also, 42% of organizations have a content marketing strategy executive. Lack of content segmenting is like casting a net into the ocean and not catching a single fish. Content personalization is essential with segmenting, you will get better personalization. You can compare content marketing to an investment. You must diversify to bet the best outcomes. You will not capture all your target audience using a single medium. When you expand, you reach more of your audience and attract the attention of new prospects. Some businesses invest a lot of time in creating content. When they do not get any traffic, they start to wonder why. What they miss out on taking note of is- they do not promote the content after creating it. No one will read your content if they do not know that it exists. If your CMS does not have analytics software, install Google Analytics. Analytics software shows you which aspects to tweak and improve your content marketing efforts. Content marketing is a long-term strategy. Therefore, its fruits may start showing after a long time. It may take longer before you see any visible impact. You can compare content marketing with compound interest. Publish your fantastic content, and the returns will pile up. Soon enough they will pour out. Strategies for content marketing keep changing night and day. Therefore, it is the responsibility of marketers to keep up with the change. Ensure that you are following leaders in the industry. You will start noticing new moves and strategies. From there, implement them. Some trends are rising with content marketing. Position your online business for success in 2018 by understanding these trends. In 2017, videos were a major deal. In 2018, they will grow bigger and better. Search Engine Journal revealed that their live videos earned them 178% more engagement in comparison to their regular posts. The reach for these videos was double the initial number as well. 2018 has enormous space for video in contrast to the other years in the past. It does not matter the kind of video you will have; it will get its befitting space in marketing. You can record video; it can be long or short, a live video, 360 videos, an animation, or an ephemeral video. It is not a lie when we say that content marketing is a long-term strategy. But is 2018, things will change a little bit. In 2018, content will be an essential building block for all marketing strategies. Brands are beginning to understand how valuable content is in business. Therefore, they are trying to create content that does not entirely revolve around selling. A perfect example is what Apple Company is doing. Apple put an investment of $1 billion for the creation of content. Yes, content is not all about selling the product. This is no guarantee that the readers will not get tired of the content at some point. Millenials are a vital part of the online consumers. They love it when brands give back to the society or give to charities and organizations. Even so, they are becoming wary of these moves. They suspect brands to use such tactics for show and are not genuine. To move forward, brands to be more open with their content creation efforts. Also, brands and influencers that work together need to be more open about whether or not a post is sponsored. TFC takes this matter seriously and has taken a step towards clearing things. It has sent out letters to 90 bloggers requiring them to disclose their relationships certain with brands. Content personalization is a challenge and a mistake in content marketing. In the past, brands only needed one post of video for a campaign. Now, everything is changing. They have to create multiple contents so that they can reach different audiences. Director’s Mix is a feature that YouTube is offering. This feature allows marketers to deliver thousands of videos in a single campaign. These videos are set apart by factors like geographic, online behavior, and actual places that a person visits. Some marketers are going a step further. They are trying to machine learning or AI to come up with ‘smart content.’ The smart content comes from putting together search marketing, AI, and content marketing. Marketers expect that content distribution will also be through IoT (Internet of Things), virtual reality, and augmented reality. This is apart from video. For instance, we have IKEA. This is a Swedish brand that has an app with augmented reality. With the app, you can see how their furniture will look like in any part of your home, office or any space. The American Heart Association has Alexa Integration from Amazon. Alexa can take you through the CPA steps at any given time. It can also give you details of heart failure and stroke signs and warnings. Virtual Reality and Augmented Reality are still new ground for content marketers. There are barriers to cost and entry in equipment. This makes it almost impossible to deliver these experiences to a broader audience. There are so many content marketing medium in the world. Even so, you do not have to use all of them. Pick the ones that work for you best and leave the rest. Ensure that is perfect for your brand and your audience because that is all that matters. After looking at the history of content marketing, we see how far it has come to where it is now. The changes are steady, and it keeps on changing day by day. Content marketing is getting more attention from marketers in B2B marketing like never before. The medium you use in content marketing is essential. But it is not as important as the strategies you have and your consistency. Have a clear understanding of cost and trends, and you will make it in your business. Thank you for sharing this information about B2B content marketing strategy, which can help you to prove employee advocacy. This is a perfect guide for any beginner to the world of B2B marketing. Content marketing is the only significant way where you can drive a lot of traffic and bring lots of traffic into your business. Great Pritha, you have done excellent work in writing every small detail. B2B content marketing can help you drive qualified leads and get started with better marketing. Thanks, Pritha for updating the article about this. Thanks a lot, Pritha for updating information about B2B content marketing which can increase awareness and volume of qualified leads in a planned way. If you want to get started with B2B content marketing, you can increase awareness and volume of qualified leads in a planned way. Since digital marketing taking the industry by storm, content marketing is something which will help generate revenue. Content marketing is a marketing strategy that revolves around the creation, publication, and distribution of content to a target audience in order to bring new traffic (and therefore new customers) to your business.